CEME conference Centre is a Gold accredited events and conference venue, which is located in East London with a close reach to The City and Canary Wharf. Based in the main CEME building, the CEME Conference Centre offers world class, conference, exhibition, meetings and training space. Conference Centre offers stylish, flexible and highly competitive solutions for all events and meetings requirements that includes a high-tech 120-seat auditorium with AV System being recently upgraded, flexible meeting and conference rooms that can accommodate 2-350 delegates and exhibition space for up to 800 delegates. CEME Conference Centre is ‘Accredited in Meetings’ at the highest Gold Standard with MIA – the only venue in the area to achieve Gold and it is also a ‘World Host’ venue for delivering exception customer service and members of ‘Conference Centres of Excellence’. Training seminars, presentations, launches and film shoots – at CEME we offer competitive rates both in London and Essex as well as a dedicated events team to the highest standards of quality and service. 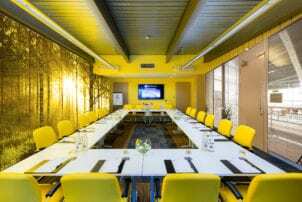 Book this venue or let us help you find more perfect Venues in East London for your event.